November 15, 2013: It was a momentous day in the family of Mehta Kalu and Mata Tripta. Their son had come of age and it was time to endow him with the sacred Hindu thread. It was the most auspicious of ceremonies. Family and friends had gathered to bless the child. The thread was to symbolize the child’s superior lineage and spiritual inheritance. A high priest had been invited to perform the ceremony. A magnificent feast would follow to celebrate the occasion. With a smile on his face and a sparkle in his luminous wise eyes, the child walked to the sanctified spot where the priest awaited him. The Priest began to chant Sanskrit Salokas, and simultaneously attempted to put the sacred thread around the child. To everyone‘s shock, the child stopped him. The priest was livid; the congregation of relatives and friends was stunned. An interruption in the holiest of holy ceremonies! The man who wears this is blessed”. The child was none other than Guru Nanak, and the words he uttered during the sacred thread ceremony define his teachings: No one is born high or low. We are defined by how we live our lives. Truth, equality, compassion, contentment, and a life sustained by righteous actions are the brick and mortar of spiritual life. When asked about his religion, Guru Nanak always said “I am neither a Hindu nor Muslim.” This was not an expedient way of side-stepping the issue about his spiritual affiliation in a tough political climate, but a deep and reflective statement from a man of God whose teachings transcended religion. Guru Nanak was pained by the tenuous state of the people of India under the xenophobic Mughal ruler Babar and the skewed nature of religious people of his time who professed love of God on the one hand and practiced bigotry on the other. As a world teacher, he rejected the exclusionary didactics of the priests of prevalent religions and condemned the displaced zeal of practitioners whose belief compelled them to coerce and convert because they considered their path the only enlightened way. No one has a monopoly over God. Upon being questioned by the spiritualists of the time about which religion is superior, he said, “without noble actions, everyone suffers”. Guru Nanak reminded the true seekers of all religions that it is their actions and their actions alone that will endear them to God, no matter what religion they practiced. As a man sows, so shall he reap, as he earns so shall he eat; he reiterated the message many times. The message of how to live was simple and straight forward. Guru Nanak often couched his teachings in metaphors familiar to farmers. Make your body the field of truth, he said. Irrigate it with truth and let goodness and virtues germinate in you. Guru Nanak always delivered his message with love, without derision and with a disarming sense of humor. At Haridwar, he prompted the Brahmins to examine their actions as they offered water to the Sun; in Mecca he awakened the Mullah to the presence of Allah in every direction. By feeding the hungry and calling it Sacha sauda, he inspired us to ensure that no one around us is hungry or impoverished. The free kitchen, Langar, in Kartarpur, where people of all castes and creeds sat down and ate together was a radical concept. And so were the Sarovars where everyone bathed together. Essentially Guru Nanak created an equal seat for everyone at the table, and an opportunity for dialog where none existed. The gurdwaras with their doors open to all were citadels of higher learning where no one was denied admission. His three golden principles Naam japna – living in divine consciousness, Vand ke chakkna – sharing resources, and Dharam di kirat karni – righteous action, were cornerstones of a way of life that uplifted humanity. Social Justice was a natural consequence of civic responsibility and engagement. As ideologies clash in politics and religion, making us polarized in our thinking, it becomes imperative to understand the true meaning of Ek Ong Kar, the core message of Guru Nanak’s philosophy. It speaks to oneness that runs underneath differences and is a call for action. Guru Nanak’s message of one Creator, one World reminds us that we cannot be insular. Each action has far reaching ramifications. 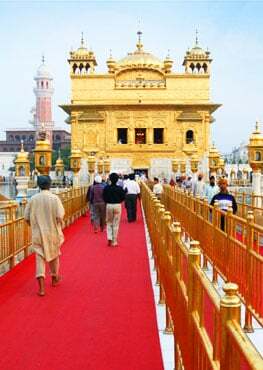 At a personal level it means that if I don’t feel the pain of your hunger, I am not alive to Guru Nanak’s message. If I violate you, I am violating myself. For me to flourish, you have to do well. Guru Nanak embraced the entire human race. He knew what quantum physicists are now discovering, that we are all inter-connected. Guru Nanak came to be known as the “sage of the Hindus and the Pir of the Muslims”. When he passed on, both the Hindus and the Muslims claimed him as their master. A shawl that he wore was torn in half and the Hindus cremated it while the Muslims buried it. Today hunger, poverty, greed, violence, natural catastrophes are ripping Mother Earth. Weapons of mass destruction pose an existential threat. Guru Nanak’s teachings are a clarion call to engage in righteous actions, to share resources and seek Divine guidance to make our planet and our lives whole.